It was a pleasure to be able to see the Junior Dirt Critters race on Monday night. I knew most of the faces, but there were also a few new riders too! Some of the younger brothers and sisters are getting involved in riding. One of these was Lacey Reeve (pictured in the pink helmet) who bravely rode down the finishing hill for the first time! The Juniors are enjoying the handicap format and are keen to see if they have improved each ride. Jason. Cam Lachal ran the senior event this week. Most riders competed over two laps of the longer lap, except for Kian Lerch-MacKinnon and newcomer Greg Ellis, three lappers. Peter Coffey raced into 1st place with a time of 45:02, Aaron Sargeant recovered from a fall to take out 2nd place in 45:06 and Mr Consistency, Dave Bock finished in 3rd place 45:55. Great work Cam for creating a close event, with the top 8 finishers riding over the line within 2 minutes of the winner. Aaron Sargeant has established a good lead in the series points on 272 points. In second place is Ethan Lee on 243 points and Brett Stevens is following closely behind on 233 points. 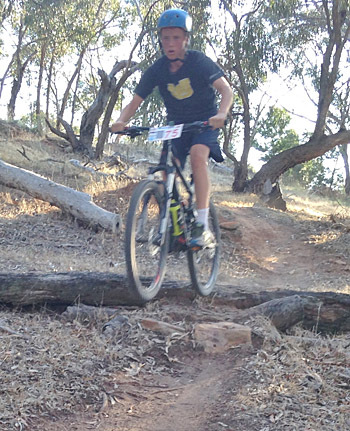 Next Monday night, 23rd February, Ben Annear from Mt Buller will be running the ‘Delatite Dash’ for Junior and Senior riders. Registration will be at 5:45pm for a 6pm start at Carters Road. Riders will be sent off from fastest to slowest, riding from Carters road to Mirimbah. Senior riders will start first and Junior riders will go off last. Junior riders will complete the course once (a distance of about 3km). 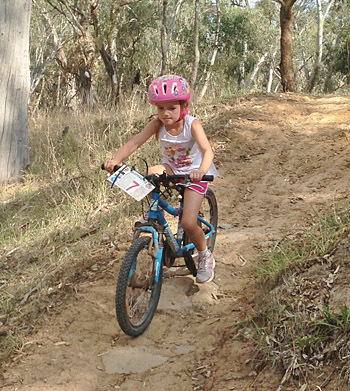 Parents are encouraged to ride with their sons and daughters as this section of trail is more technical than riding at Riflebutts Reserve. After this they will head to Mirimbah Park for a free BBQ. The Senior riders will complete the course once. They will then ride back down Mt Buller road to Carters Rd and will complete the course a second time. Afterwards, Ben has organised to cook a BBQ. This is the first time an organised event has been held on this section of track, so it would be great to get as many riders along to participate in the event. Head to Bright to support our local riders competing for the National title. 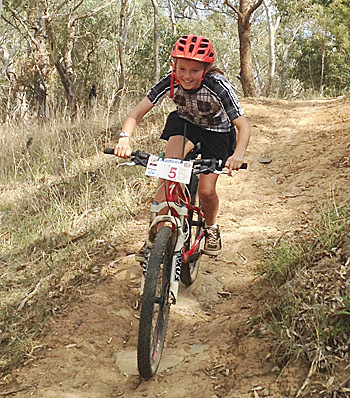 The Mansfield Mt Buller Cycling Club’s race on Thursday 19 February was the annual Four-Up sprint race: a series of sprint races along a 500metre section of Graves Road. A-grade had seven starters: Darren Bakker, Mauro Brega, Anthony Plummer, Cam McGann, Foley Lachal, Aaron Peterson and Bruce Halket; while B-grade had six starters: Will MacDonald, Wil Wilson, Tony Williams, Gus Muscara, David Jagger and Geoff Jones. Foley Lachal was fastest on the night. He consistently starting his heats quickly and tried to hold on all the way to the finish. This would have proved very successful had he not broken a couple of simple safety rules and been relegated in two heats. Controversially this meant he missed out on the A-grade final by one point. D’oh! The B-grade final saw MacDonald just get up over Muscara, who were both clear of Jagger and Williams. The closest finish of the night saw Halket pip Plummer by a tyre’s width, ahead of an unlucky Bakker and Peterson. Above: Will MacDonald and Wil Wilson fight it out during one of the Four-Up heats, both resplendent in the old MMC jerseys. Will did it so easy he wasn't even in the drops! Photo: Mansfield Courier. Plummer had to have a little lie down after the A-grade final. He adopted the foetal position for a minute or two but strenuously denied vomit was involved. Many, many thanks to our officials and volunteers: Di, Jenni, Margaretanne, Leonie, Dave, Peter and David. 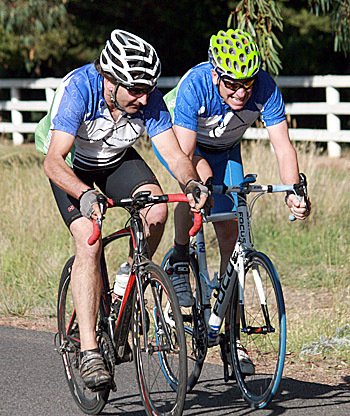 The MMBCC’s Summer Series continues on Thursday 26 February with a Handicap Race along Howes Creek Road; entries via SMS to 0438 513 355 by 8pm on Wednesday please.